Why all our postcodes now contain seven alphanumeric characters? Will An Post, Amazon, Bing, Ebay and Google be using this new postcode ? What Is Cost Of The Service ? Isn’t the Government supposed to have one ready by Spring 2015 ? Why do certain addresses, sometimes on the same street or road have two or more postal codes ? Can you show me how to use this code and give a few examples to guide me ? Please explain the recent changes and the expansion of your postcodes. I’m confused about the new system! In line with future expansion, technical issues and international standardization All our alphanumeric codes now consist of seven characters. All six postal codes from NW1 to EC5 will be expanded to seven digits. If you presently have a six digit code, simply add a G to the end of the code. For example, if your present six digit code is NW1 186 simply add a G to the end. Thus your new code is NW1 186G. Here’s another example, EC5 837 changes to EC5 837G. It’s that simple! If your address is within the SE6 Galway postal district with a seven digit code -these changes do not apply to you. Hopefully, in the future this postcode can be amalgamated into Sat-Navs, Google Earth, Bing/Google Maps and other websites that want and need a postcode to perform their business in a more efficient and speedy manner. I envisage that local authorities and organisations will utilize this code and have the opportunity to incorporate it into any future signage or signposting. On the proposed introduction of a future national postcode for Ireland, the distribution company, DHL commented: “The new postcode will give rise to efficiencies for businesses and public services across the economy.” Hopefully, galwaywaypostcode.code will do likewise for the people of Galway. Hopefully, all major postal agencies, distribution companies and commercial retailers will start using this simple postal code system to expediate the delivery of their products, services and goods. There is absolutely no fee or cost for using this service. It’s totally free and ready to use now. The code can be expanded to reflect future city growth and is fully integratable with future postal code systems. Recently, it was announced that a consortium headed by Captiva has been awarded the tender to develop, implement and operate the a new postcode system by 2015 – at an estimated cost of €20 million. Hopefully, galwaypostcode.com can be amalgamated with the proposed new national postal code system. It is entirely possible that the two systems can be weaved seamlessly together – like they intend to do with Dublin’s present numeric system postal system. The good news is that galwaypostcode.com is available right now, whereas, the proposed national postal system will not be launched until late 2015. This occurs when a road forms the border between two or more zones. The Headford Road traverses three zones – and thus has three separate codes within NE2, EC5 and SE6. This is also the case with the Rahoon Road, which also stretches into three zones – NW1, SW3 and SW4. A section of Threadneedle Road is the dividing line between SW3 and SW4. So the Salerno School side of the road is in SW3, whereas, the Anno Santo Hotel – just across the road, is in SW4. The same applies for the Seamus Quirke Road, where a section of it forms the boundary between NW1 and SW4. The Sacred Heart Church is in NW1, but Aldi – across the road , is in SW4. The system is really straightforward and completely user friendly. To find your postcode simply scroll down the A-Z residential list to find the postcode for your address. Here’s some recently asked questions that you may find helpful. Question 1: I’m from the Ballagh area of Bushypark, what’s my postcode ? Ballagh, located in Bushypark in the North-West of Galway (NW1) has the following postcode: Ballagh, Bushypark, Galway NW1 105G. Question 2: I rent in a flat in Menlo Park Apartments, do I have a postcode? All apartments in Galway have been assigned a postcode based on geographical location. Since Menlo Park Apartments are located in the North-East of Galway city, their code is NE2 244G. Question 3: I live in 19 Sylvan Fairlands Park, Newcastle, Galway. What is my postcode ? 19 Sylvan Avenue, FairlandsPark, Newcastle, Galway NW1 186G. Alternatively, you could also use the listed code for Fairlands (146) or Newcastle (173) for this address. Question 4: I reside in the Oaklands area of Salthill here in Galway. Have I been assigned a new postal code? All areas within the Galway city boundary have been given a postcode – no area has been intentionally excluded. Galway has been divided into six zones –NW1, NE2, SW3, SW4, EC5 and SE6. Your address is within the South-West of city and in Zone 4, thus your code is: Oaklands, Salthill, Galway SW4 680G. Question 5: I’m from Ard An Choiste on the Headford Road, what’s my postcode and zone ? Because of its sheer length, the Headford Road, traverses the whole eastern section of Galway city and occupies three postal zones –NE2, EC5 & SE6. If you refer to the map, you’ll see that you are located in the NE2 section of Headford Road and your code 201. Hence, your full address is: Ard An Choiste, Headford Road, Galway NE2 201G. Question 6: I’m from Ceannt Avenue in Mervue, Galway. What’s my postal code zone and number ? You are located in the East-Central, or EC5 area of Galway city. Your street’s full address and postcode is: Ceannt Avenue, Mervue, Galway EC5 855G. Question 7: I live in the City Centre of Galway, what postcode should I use? 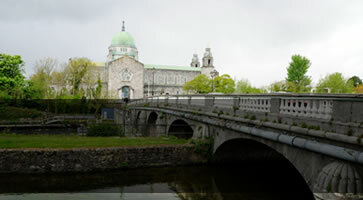 Galway’s city centre lies within two separate postal zones seperated by the Corrib. Depending on what side of the river you reside in – west or east, your zone will be South-West (SW4 545G) or South-East (SE6 1042). In your question you did state your postal address in the city centre, if you did so, I could refer you to the list to find your exact code. For instance, if you live in Sea Road your code would be SW4 733G, or across the river in Middle Street it is SE6 1152. Question 8: Why isn’t Barna, Oranmore and Moycullen etc. included in Galway’s new postcode? Although, these areas are in close proximity to Galway city, they are not within the official city limits / borders – and thus are not included. It is only suburbs and areas within Galway city that are serviced by the new postcode. Question 9: I’m within the city boundary, but I cannot find my postcode on your list? Even though, you are located within the city boundary – your residence may not be part of a housing estate or an apartment complex. Hence, it has not been assigned a full six or seven digit postal code. To further complicate the situation, many houses are located in small lanes and boreens within the city boundary that don’t have any name – official or otherwise. If the above situation applies to you, simply use the first three digits that identify your zone, i.e. NW1, NE2, SW3, SW4, EC5 or SE6 as your full postcode. Question 10: Is it just residential areas, e.g. housing estates and apartments that are covered by this new postcode? Although, residential area comprise the majority of this website’s content – large industrial estates and significant city infrastructure have also been postcoded, i.e. assigned a unique alphanumeric code. Residential areas of the city are coded sequentially: starting at 100 and ending at 1241. Industrial & Business parks are also numbered sequentially: starting at 2000 and ending at 2032. Infrastructure, i.e. bridges, junctions and roundabouts are numbered sequentially: starting at 3000 and terminating at 3017. These have been coded to facilitate future integration into satellite and mapping navigation systems etc. Question 11: The new national poscode has just been officially launched by Eircode. What’s the point in maintaining and promoting your Galway postcode system? A monopoly is undesirable in any situation, why should the provision postcodes be any different? The people of Galway now have a choice: whether to embrace the Eircode system, or opt to use the codes provided by Galway Postcode – or basically, not use a postcode at all. It’s that simple! But of all these choices, at the end of the day, people want a simple, sequential and understandable system. I think, galwaywaypostcode.com ticks all these boxes. You’re not the only one! Our mailbox has been unindated with questions about the changes to Galway Postcode. We apologize sincerely for any confusion caused – that was never our intention. We never envisioned that the inclusion of an extra letter to the alphanumeric code would cause such angst and mayhem. We admit we got it wrong, in not giving sufficient notice about these sudden changes to our system. I’ve selected some of the many questions we got concerning our recent changes. In order to bring clarity to the matter I’m posting some of these questions below along with my response. I hope you find them helpful in banishing all your confusion. Question A: I’m annoyed about the new changes introduced to Galway Postcode. Why didn’t you leave it the way it was? Answer: The new changes are very minor – just the addition of a G to the majority of codes from NW1 to EC5. Here’s an example of just how minor the new change is: NW1 186 is now NW1 186G. Just think G7 or 7G: now seven characters by the addition of a G. Incidentally, there will be no changes to any of the postcodes within the South-East 6 (SE6) postal zone – since all these codes already are seven character in length. To address the second part of your question concerning the reasons for these changes, here’s a quick explanation: To facilitate future convergence with other international postcode database systems – all our alphanumeric codes now consist of seven characters, as opposed to six. Felicitously, this unavoidable technical change, i.e. the addition of G has now given the postcode a unique Galway identity. Question B: I’m from Ballindooly on the Headford Road, but I already have a seven character postcode. Do I add a G at the end of my present postcode? Answer: No, because you already a seven character alphanumeric code the addition of the G is not needed. Your particular address: Ballindooly, Headford Road NE2 202 A was a late addition to the Galway Postcode database. Hence the addition of the A at the end of the code. The same rule applies to Moyola Lane in Newcastle, which has also a seven character code ending with an A, i.e. Galway NE2 202A. Question C: I live in Hawthorn Drive in Renmore, Galway SE6 1108 what changes are occurring to my postcode? Answer: None! Because your address is within the SE6 postal zone, it already has seven characters. The addition of G at the end of your existing postcode is not necessary. The same applies to all the other addresses within the South-East 6 (SE6) postal district.